CODY, Wyo. – Dusty Tuckness knows Stampede Park as well as anyone. He grew up around the storied arena, home to much of rodeo’s history. Raised along the Greybull River half an hour south in Meeteetse, Wyo., the 30-year-old bullfighter has spent plenty of time inside the arena; that includes the last 13 years in cowboy protection at the Cody Stampede. 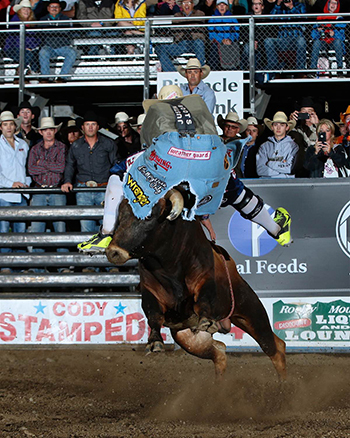 On Thursday night during the Bullfighters Only freestyle bullfight in Cody, Tuckness put on a show by himself, dancing across the arena dirt with a speedy and agile red bull for 91.5 points. Not only is it the highest-marked fight in Bullfighters Only’s brief history, it earned propelled him to the title of the fight, held in conjunction with the Cody/Yellowstone Xtreme Bulls. “He was a pretty good bull from Darrell Diefenbach,” said Tuckness, the reigning six-time Bullfighter of the Year in the Professional Rodeo Cowboys Association. “We had a bunch of young bulls in this pen, so we really didn’t know what to expect out of them. I had the pick of the night. He finished much better than he started. As Tuckness attempted to jump the bull to begin the fight, the animal got just enough of the bullfighter to spin him to the ground. “We just got off our first big stand-alone event in Cedar Park (Texas), and we wanted to build off our momentum there,” Tuckness said. “I was glad to be part of this event here in my backyard. Bullfighters Only is a freestyle bullfighting showcase of the top 15 men in the game. While Tuckness tests his skills against each bull he fights through the season, he does so in a competition with several others. In Cody, Weston Rutkowski of Haskell, Texas, finished in a tie for second with Nate Jestes of Douglas, Wyo. ; both men scored 87 points. “I talked to the (Cody rodeo) committee, and a lot of them were pretty happy with the bullfights,” Tuckness said. “The biggest thing was that the crowd loved it and stayed around. We signed autographs after it was over for probably an hour and a half, so that was great.